Unable To Conceive? Alcohol Or smokes!! For women who are waiting to conceive, it can be disappointing, confusing and even bewildering when conception is desired but does not occur. There may be several co-contributing factors, or the cause may be indeterminable. Most of the studies have shown that smoking causes harm to the fertility and reproduction process. There can be a high risk of spontaneous miscarriage. It is harmful to the ovaries and the degree of damage is dependent upon the amount and length of time a woman is exposed to a smoke-filled environment. Nicotine and other harmful chemicals in cigarettes interfere with the body's ability to produce estrogen, thereby making it harder to get pregnant. Research shows that smoking has a devastating impact on a woman's chance of bearing a baby through IVF. Smokers are 60% more likely to be infertile than non-smokers. So, Health experts recommend that quitting smoke may not only help you get pregnant faster, also women get a head start on conceiving a healthy baby, well before becoming pregnant. Alcohol consumption is now widespread throughout many countries. The quantity of alcohol consumption in Indian population is yet under discussion. A recent study has shown that an occasional glass of wine or a bottle of beer probably won't hurt your odds of conceiving. 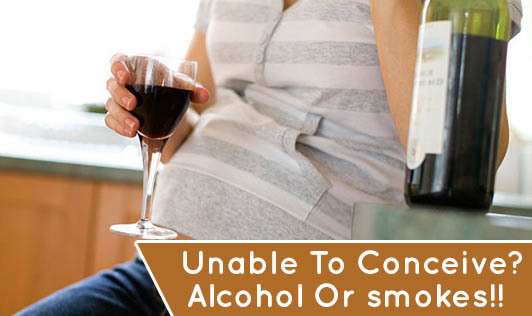 Just make sure you aren't pregnant when you imbibe, because alcohol can harm a developing fetus. Although studies of alcohol's effect on fertility rates are inconclusive, some do show a slight link between drinking and difficulty conceiving. Danish researchers looked at 430 couples trying to have their first child; they found that a woman's ability to get pregnant decreased as more alcohol was consumed. The above conclusive data shows that increase in infertility may be due to ovulatory factors or endometriosis, with alcohol use. Hence, these can be reduced or possibly even reversed, if you cut them before you plan a pregnancy. If you find any difficulties to quit, talk with your experts to help you quit smoking, reduce caffeine and alcohol. Improve on your diet too to improve your chances of conception!